Mrs Margaret White, the creator of this beautiful woven shawl in CARINO, has kindly agreed to the publication of it together with some relevant technical information and the list of dyes used. 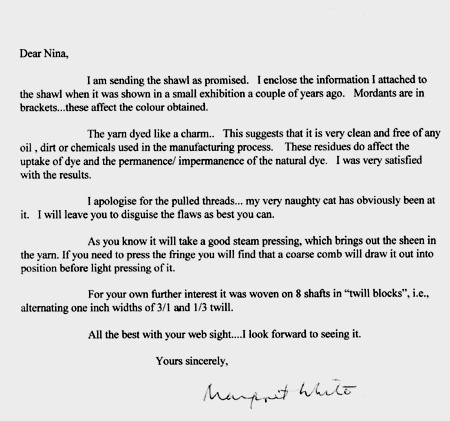 As can be seen from Mrs White’s letter (published in its entirety below) this adaptable, versatile and durable yarn can be subjected to rigorous treatment without losing its sheen, softness or lustre. 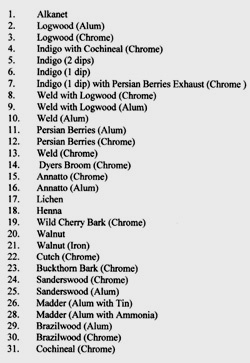 ROMA, CARINO, MILAN as well as some ALPACA blends are ideally suited for weaving. 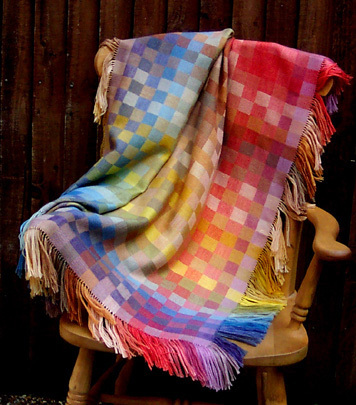 This spectacular shawl was created from one 400 gram cone of CARINO – Wool/Silk blend, of which 31 lengths were wound off and individually hand dyed. The shawl, approximately 120 cm x 120 cm, weights a mere 198 grams which by itself is a sign of the superior quality of the yarn used.